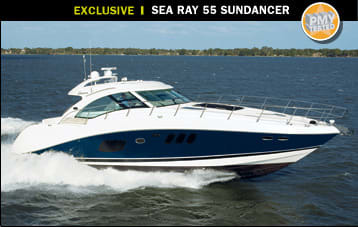 When I drew the assignment to test the Sea Ray 55 Sundancer, I wasn’t exactly thrilled. I’ve tested I don’t know how many Sundancers over the years, and I know they can be hard to write about. The basic Sundancer concept—a midcabin, V-drive, express cruiser—is long established, well-proven, highly successful, and essentially unchanging. Differences from year to year tend to be incremental and often relatively minor, and as I approached the 55, nothing indicated this Dancer would be any different. Her external styling, while accented by nicely blacked-out windows on both sides, was still quite recognizable. I figured that if there was anything really different about this Sundancer, it might be lurking in the engine room, so I decided to go there first, before things heated up. I stepped from the dock onto the 5&apos;7"-wide swim platform and up into the teak-sole cockpit, where a large hatch provides access to the mechanicals below. 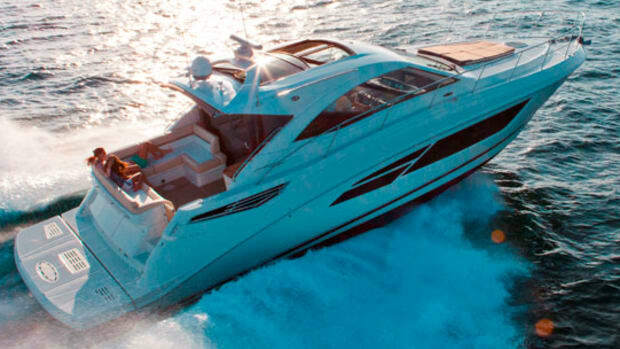 In typical Sundancer fashion, the V-drive configuration places the engines well aft, a design that quickens planing and enhances on-plane performance but can in some cases increase bow rise. 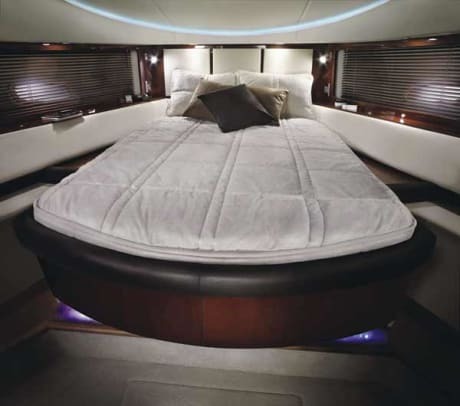 When I climbed down the three-step ladder, I found what can only be described as a mechanic’s dream, a space that rivals that of many megayachts in its roominess, access to key components, logical layout, and quality of finish. Headroom is 6’8”, and you can easily—and I do mean easily—walk all the way around either of the twin 765-hp MANs. (The optional 861-hp MANs are V-8s.) Heck, you could rebuild them in here. Not only are all maintenance points at hand, but you can actually reach and service the shaft logs beneath the engines. I can’t remember the last time I saw that in any V-drive boat of any size. In fact, there isn’t a single component in here that you cannot easily reach, and most—but not all—are well labeled. I did notice two oddities. One was large holes cut into the overhead to allow the passage of ducting and piping. There being no attempt to seal the considerable space around them, they provided a lot of space through which sound could escape, apparently obviating the plenteous acoustical insulation everywhere else. 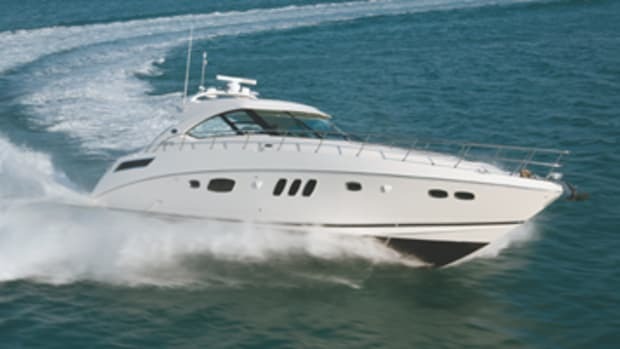 Second, to make the engine room more mechanic-friendly, Sea Ray mounted a fan to an aft bulkhead to circulate ambient air. It’s a thoughtful idea, but it’s also one of those oscillating desk units you’d pick up at Staples. Now I’m sure it works just fine (I didn’t need to try it), but I expect something a little more sophisticated on a $1.5-million yacht. I’m guessing this was a stopgap measure employed for Hull No. 1 that will be upgraded on production models. 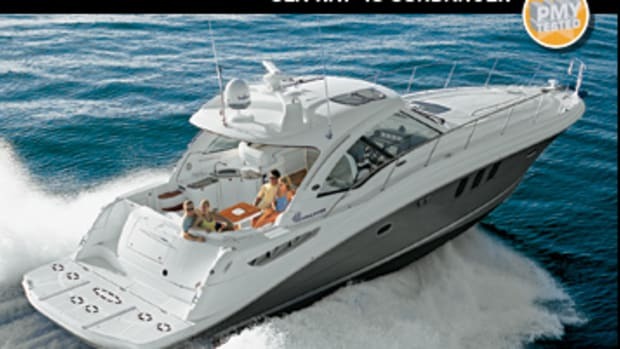 Please, Sea Ray, tell me I’m right. Okay, so the 55 has a great engine room. But I knew that as soon as I left it and stepped inside, I’d find the same forepeak-saloon/galley-midcabin layout. And indeed I did. 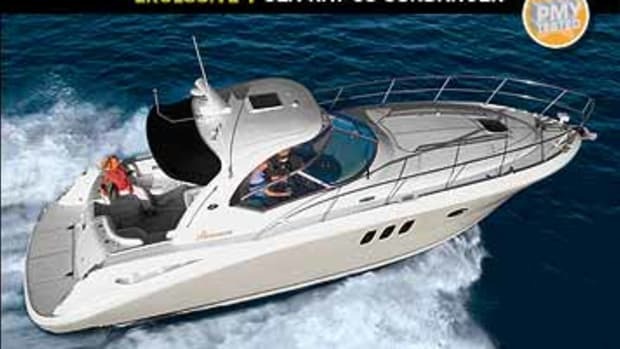 But this one has a mahogany interior, the first on a Sundancer. I know that the choice of interior wood on a boat is a relatively minor characteristic, but the dark, rich mahogany transforms this boat. In terms of joinery, finish, and fit, this interior provides nothing short of a quantum leap compared not only to other Sundancers, but to other Sea Rays. Heck, it raises the bar for the entire category. The satin-finished wood looks terrific and very rich. Some of the larger cabinet doors, like the starboard-side one that holds the entertainment equipment, have translucent glass that add an elegant touch. The door hardware is nicer, too, and there are port and starboard skylights with sliding shades to help brighten things. I also liked the unified electrical control panels, which replace individual controls for lights, A.C., and even the MSD flush button; the big LCD TV that retracts into the galley island; and the starboard couch that converts to a double bed, although I have a problem imagining six people living aboard this boat for anything more than an overnight. At this point I was pretty sure I’d have no problem finding a theme for my test of the 55, and I was also pretty sure that I’d discovered all the surprises this surprising boat had to offer. Nevertheless, it was time for the obligatory sea trial, so we fired up the MANs and I headed to the bridge deck. Once again I found innovation. The hardtop has port and starboard manually sliding sunroofs, and the instrument panel is uncommonly uncluttered, since it holds just two big displays—no gauges. The information they would normally convey is available from the MAN electronic displays in the overhead, which you can configure in a seemingly infinite number of ways. Aft of the helm is a beautiful circular table surrounded by two 120-degree curved settees that move along a circular sail track. With stops about every eight inches, they let you configure the seating in, well, a seemingly infinite number of ways. We ran the test, and the 55 turned in good numbers—Sundancers always do. And then I took the wheel. After not much more than a few minutes, I came to the inescapable conclusion that this is the best-running Sundancer I’ve ever been aboard. Maybe not the fastest or the quickest, but the 55 is without question the most rewarding to drive. She planes effortlessly—you’re never quite sure when you’re on top, but I’d guess the transition comes at around 1600 rpm with no hump and bow rise never exceeding four degrees. And even that is scarcely noticeable, given the downward-sloping foredeck. As you can see in the test results, sound levels are low. I don’t know what happened with those holes in the engine-room overhead, but they didn’t seem to have any negative effect on my dB meter. 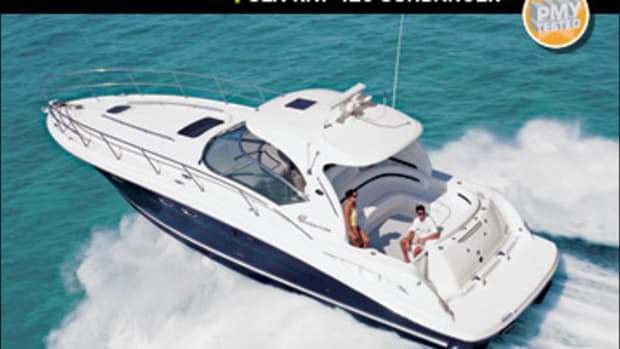 I do know that Sea Ray made a big change in the exhaust system. 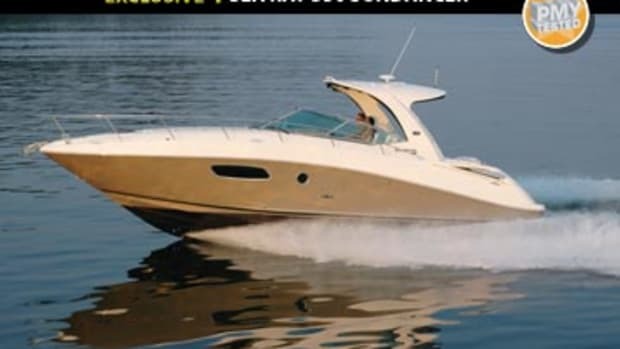 Bucking not only the Sundancer norm but that of boat design in general, it eliminated the underwater exhausts in favor of big corner outlets reminiscent of what you’d see on a convertible. For whatever reason, they work, and moreover, I could discern no station-wagon effect. The 55 also responds nicely to wheel input, until you put the helm hard over at full speed, where the turning radius gets a bit wide. In fact, it almost feels like the rudders lose their bite at the extreme. 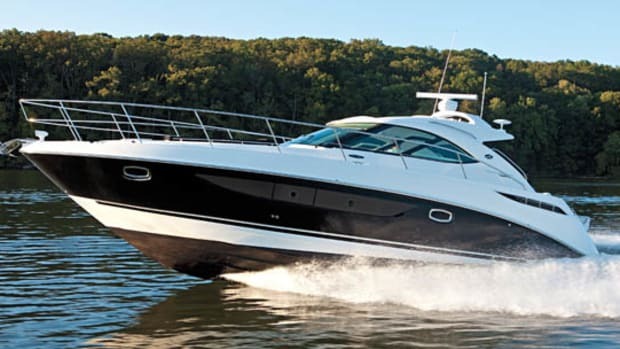 There is also a fair, but not unusual, amount of heel during top-speed, full-over turns, to the point that you lose vision out of the inboard side, nothing unusual in boats of this genre. My only beef: I didn’t like having to look up to the MAN displays to get engine rpm. I’d prefer them on the instrument panel. By the time I returned the 55 to her handlers at the company’s Sykes Creek facility in Merritt Island, Florida, I was ready—no, eager—to write. This is one of those cases where a builder chose to really up the ante on a successful model, instead of just tweaking it. And when you get a boat like that, the story just kind of writes itself. 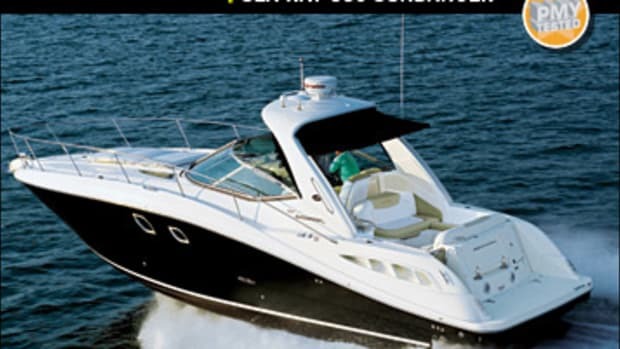 For more information on Sea Ray, including contact information, click here. 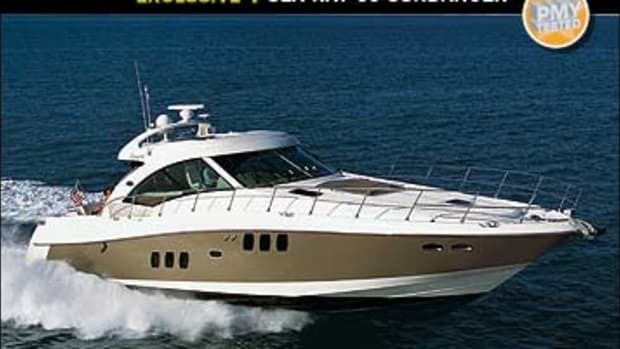 This article originally appeared in the April 2007 issue of Power & Motoryacht magazine.